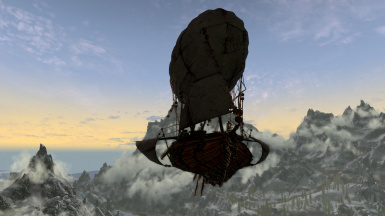 Bringing two wonderful mods together, the airship from Moonpath to Elswyer and the interaction from the Fully Flyable Dwemer Skyship to create this amazing vessel. 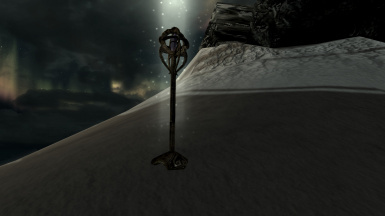 -Currently located near Solitude Behind the Blue Palace. Read the Instructions Installation directions, FAQ, walkthroughs, and instructions for submitting bug reports. To be perfectly clear, this means you may make patches at will, but reuploading the entire mod to make your edits is not allowed without express permission. If I do not respond to you, this is NOT to be interpreted as permission. Muppetpuppet - Original model and interior (Without which I would not have been so inspired). 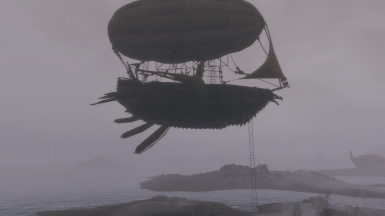 NoxyGame - Working airship mod (An unquestionable supporter and unyielding imagination). 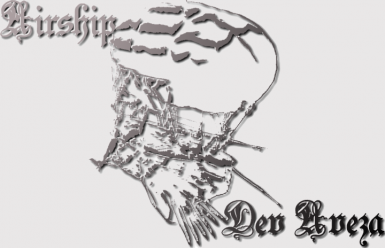 DosMaster - Script (Without whom the ship would be sadly immobile). Kohdi - First interior redesign (Thank you for your enthusiasm and remodeling efforts). Oaristys & Tony 67 - The fantastic Modder's Resource Pack. Runespect - The Resources for Modders compilation, and thanks to all the original creators of those items as well. 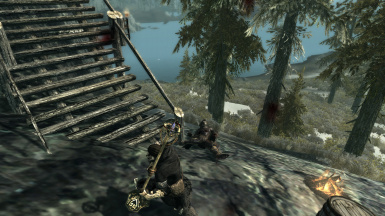 Borgut1337 - Inspiration for the rope ladder, based loosely on Sneak Tools Rope Arrows. 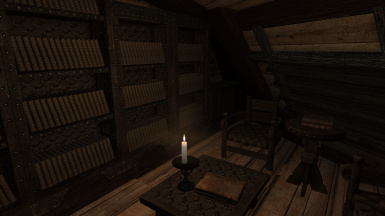 AeonVita - The Summon Followers script, used to make the scripts which summon followers when using the cabin hatch or rope ladder. 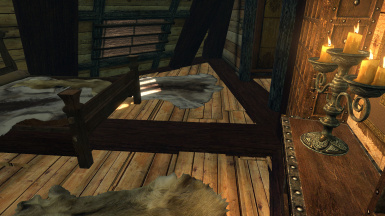 Chesko - Allowing use of their item placement offset script from Frostfall. Sjogga - The original Auto Sorting scripts. TKHBMVP - For the diligent and continued support by providing a German translation for every update. Kudos for that! 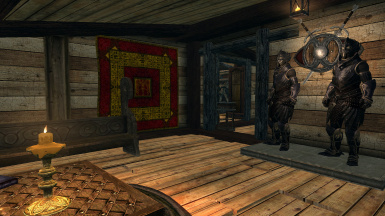 Teuffel - Allowing use of Daedric Display Case models originally from General Displays. Tamha - My Lovely wife whose support has been unwavering in the thousands of hours spent working on this project. 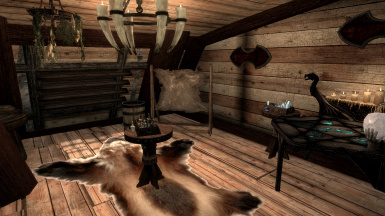 Setting up the Auto-Sorting system in the Dev Aveza interiors, maintaining the mod information page, the web page, creating the now deprecated NMM and BAIN Installers, and beta tester. darkedge42392 - For moral support and helping me through the more stressful stages of development on this continued work. Forzane - Primary Beta tester, Dark Hull Texture reworking and Nav meshing for full interior and approach. Sphinx019 - Designing the Full scale interior hull. 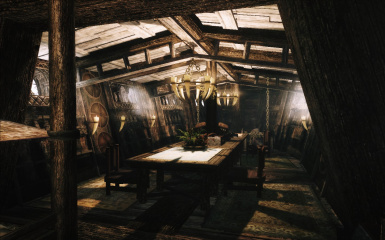 AndrewScrolls - Creating a beautiful map of Tamriel and allowing it's use in the interiors of this mod. The original can be seen in his DeviantArt gallery. ThePhotographer - Made some of the earliest user images of the Dev Aveza, helping to make our user image section the lovely gallery we have today. DarkOne and the Nexus Staff for hosting this amazing community. All of those wonderful people who have posted models and other resources to the community. Bethesda Softworks - For making Skyrim and it's Creation Kit. Cruise control no longer affects nor is effected by turning, strafing, or elevation changes. Exit control functions imediately now and no longer needs to be held to register the keystroke. Inverted left and right turning controls when traveling backwards for more intuitive control. Coming Soon, changes listed here for tracking purposes. Added Water collision awareness to stop decent if the ship reaches the relative waterplane for the given cell. Corrected an issue with the MCM which was interfering with the MCM reflecting camera selections made with the camera toggle key during flight. Corrected a model issue which was causing the downward and upward movement to have unintended shaking which was interfering with movable on deck mode and other flight engine scripts. Added limited forward collision detection system as proof of concept, will require further development. Corrected a papyrus error which was delaying flight initiation. Updated follower script to adapt to the needed condition and supmmon the follower only as many times as needed for the location conditions. End Flight / Exit Key now works instantly on keystroke rather than the update sequence with the flight controls. Added notification on pressing the exit key to alert the activation of the command. Corrected asset handling for both lighting and ladder previously visable assets after cell reload should no longer be visable in any condtions. Added modified oilbarrelopen NIF file to correct an issue which caused the barrel to have clutter behavior despite static settings in the creation kit. repaired heat object orientation and placement for frostfall compatability. Modified plank scripts to allow for slightly improved behavior. Potentially other minor fixes which I have forgotten. 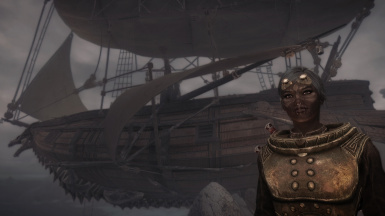 Resolved an Issue causing the Dark Version to blink briefly on dismount. Resolved a problem with player model attachment when moving to a new worldspace with the ship. Resolved an issue in Attached mode which did not fully attach assets if turning without foward movement on initial flight. Added safety measure to update the player model if detached during flight. increased flight attachment monitor time from 0.2 seconds to 1.0 seconds to reduce process usage of flight. Resolved an issue which prevelted the left wing light from illuminating at night when stopped. Corrected issue preventing interior access at starting position. Corrected issue which could cause utility assets to be visable when they were not intended to be. Corrected issue which prevented some of the lighting assets from being fully disabled when the option to do so was selected. modified flight and stationary light intensity to be less overpowering and closer to eachother at peak. Modified MCM scripts to reflect the flight mode at the end of the last flight session. Added flight control restriction until flight model setup completes to help limit script interruption. Clean Save Required! Bug Reports Require reproduction on a new game without exception!! Corrected an issue with Script sequence which was preventing the beacon and reset ship alignment functions from completing. Corrected script issue where not all assets where changing properly when selecting a different hull type in mcm. Corrected an issue which caused pixilated shadows for some users. Modified lights in full cabin and added some different lighting techniques. Merged Previous hotfix files into main archive. Corrected for a script issue potentially disabling the player AI inadvertantly. Modified MC menu to check for key setting conflicts. Adjusted climb lighting and ship deck lighting. Added Object Property Handling system, extensive script restructure. Attached to ship mode will now set player model behind the wheel in a fixed position while camera retains previous position for the mode. Camera toggle added to MCM allows for flight mode change during flight session. Multiple script improvements for flow and stability of new features. Cleared obstructions from interior windows to allow more natural light flow, modified interior lights slightly, (still has light clipping) Resized and re-oriented smelter fire. Corrected Armed version beacon and map functions to be more in line with other versions deploying ladder when reaching the map point and properly teleporting to the beacon when summoned. Added triangulation method to ship as part of the netimmerse functions when they have rotation. Developed limited actor attachment functionality to the ship, currently used by 2 skinless biped Actors for use with camera focus functions. Restricted player movement while attached to ship to retain static animation. 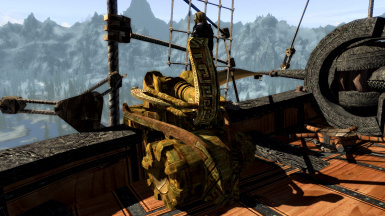 When switching from attached mode cruise if enabled will disable to allow natural speed reduction and limit chance of the player being knocked off the ship when decending the stairs. Corrected issue with Plank which interfered with intentional functionality. Moderate changes to interior lighting, may flicker, will be fully redesigned later. Corrected for unintended sounds in original and Alternate Interiors by changing acoustic space. Attempted to correct for an issue which was affecting a user and seeing the beacons fail after a couple of in-game days in another world space by setting them and their corrisponding light effects to player owned upon creation. Reminder: Users should be following the bug reporting steps to provide accurate information on their issues. Corrected a standing issue that porevented use of the beacon system in the Original and alternate versions of the interior. Added SKSE and Payrus validation system to help ensure flight and game stability. 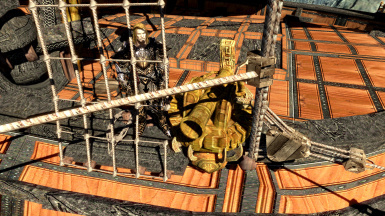 Corrected an issue which, when using animated models for the trap doors would leave them in an open state after traveling via the interior maps. Corrected a potential conflict which could cause fast travel to become perminantly disabled. Corrected an issue which prevented proper functionality of the reset feature of the mcm menu. Added height limit and estimated current reading when using the rope ladder to give a basic reference on how much adjustment might be needed. 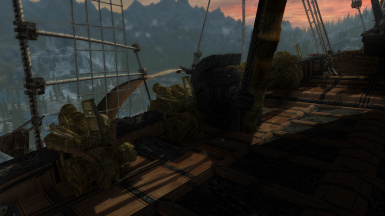 Slight increase to the length of the rope ladder and added dynamic placement to allow layerd collisions to be referenced such as platforms and single layer boulders. Significantly increased accuracy of the rope ladder system when determining distance to the ground. 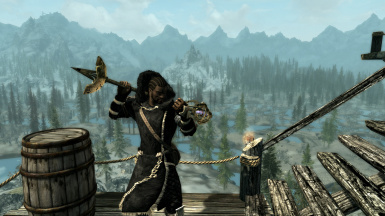 Cleaned mod with tes5edit to remove any duplicate entries created during development. 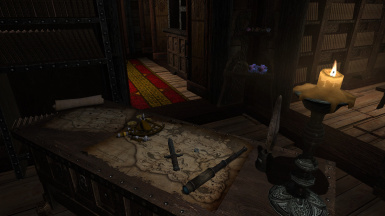 Traveling between worldspaces via the interior maps will place you on the deck of the ship, some script delays may have you appear at the beacon briefly before moving to the wheel. 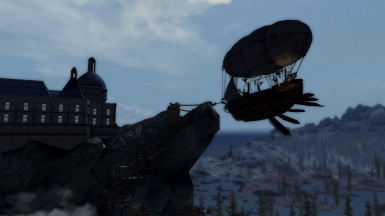 All functions and features of all three internal and external models verified in working order, beacon travel system tested with Skyrim, Solstheim, Falskaar, and Wyrmstooth. Corrected an issue which prevented the MCM menu from populating after a 'clean' save without the mod installed where it had been previously. 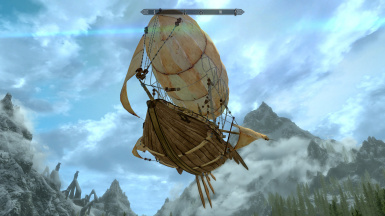 Corrected an issue in the Map script that caused significant errors when moving the ship to Falskaar. Modified beacon markers to remove the numerical end in their name as that was for testing and was not intended in deployed mod. Modified the order of the markers for the beacon system to correctly reflect the assignments in the script. Re-named sorting scripts to reflect uniformed capitalization of the Mod. Corrected issue with Manniquin Sandbox status where some followers would see the manniquin as a hostile creature when sandboxing away from player view. Corrected erronious flag which made the invisible object used for determining height for the rope ladder appear in the leveled list when added from an external source, those additions such as sum or spike may need to be renewed to apply this correction. All previous changes carried into this version. Corrected Faces on Dark version to fix inverted shadows. Overhauled UV's aover the entire ship mesh. The textures should appear more pleasingly to look at. Reduced polygon count bay more than 50% on the complete armed model the impact of these changes will very depending on which hull is used. Alighned and removed excess mesh faces to provide an overall cleaner appearance. Replaced stairs with a new model and added back rails around stairs and pilots tower. Converted collision system to complex bodies for more accurate and responsive collisions, extended collision system to areas that previously did not have any collision. Minor modifications to scripts to adjust for deck placement of the player when being moved by the script to avoid falling through the ship. Adjustment needed due to more accurate collision system. Added Auto-Sorting sytem to all three interiors. Added edited (mod-tagged) auto-sorting scripts. Replaced, removed, modified or added most containers in all interiors. Altered some internal references (on containers and statics). Replaced a bunch of "clutter" in the Alternate interior with static objects. Fixed the Travel System maps in the Original and Alternate interiors. Added Beacon travel function, Beacons require Dwarven Smithing Perk to make. Adjusted scripts to eliminate ship phasing out during activation. 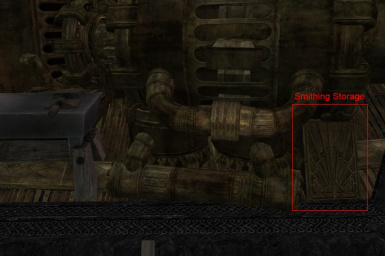 Added dwemer smelter model from community resources. 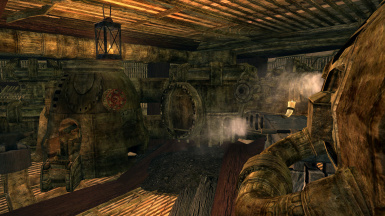 Adjusted some object placements in the engine room. 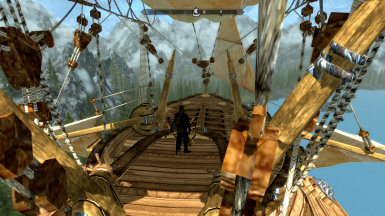 Removed dragonborn esp patch in favor of reset ship locaton functiuon. added scripts to move active followers into and out of the interioor and ladder. Modified player on deck compensation script definitions to have less script impact. Disabled slide compensations on Armed version due to internal conflicts which need to be resolved. Corrected mod conflict that could break the hatch. Update to the Full Cabin interior lighting. 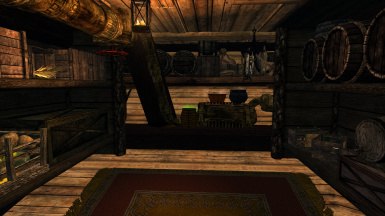 Assigned all containers in 'Full' interior to player owned with mod specific references. Removed 1 excess container in the initial entry (large chest) Advise emptying prior to update. Corrected script issue with the plank which prevented manual resetting of the plank via the plank switch. Corrected 2 NavMesh Issues one exterior and one in the full interior. Added Debug option to the MCM menu for issue isolation, currently will post to the papyrus log for player movement script source to isolate a random teleport issue. 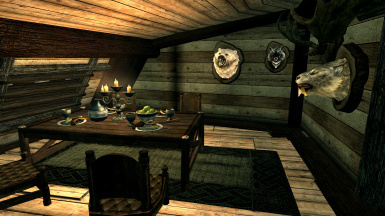 Moved Interior selection to the MCM menu to simplify Mod development. Modified hatch scripts to limit issues and isolate the transition away from vanilla script interference. Tamha redecorated the crafting room for better animation placement. Implemented slide fix changes on a toggle to address some previous issues. New Reset function will allow the ship to be populated in any exterior worldspace. Improved flight launch script to limit loaded models at launch and hopefully help users with slower computers. Applied option limited to MCM to reduce accidental conflicts by changing settings during flight. Slide fix switch requires both the fix toggle and movable on deck to operate reducing script load in attached to ship mode. Added functions to reduce sliding in movable on deck mode. Reworked ship collisions for a slightly more accurate collision system. 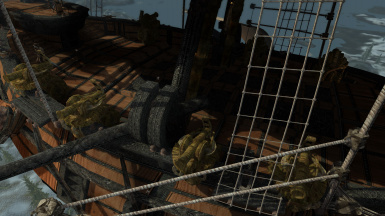 Refined Models and UV maps on Bore and gear shield meshes for all cannons on armed version. Revised travel script to work better across all versions. Armed version requires new main script, new save advised. Revised armed version cannon scripts, should no longer see cannonballs dropping. Reworked the Full interior, if updating please remove all items from the interior and save prior to updating. Implimented a collision workaround to enable actors to remain on deck in the attached to ship mode. Removed the old book interface, the mod contorls will be done entirely in the MCM menu from here on out. hopefully resolved the issue where vampire characters were recieving damage in the full interior during daylight hours. improved travel system scripts to maintain proper orientation when arriving at the destination. 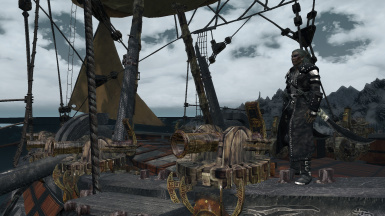 Altered npc gear to be more balanced for the average level of obtaining the ship, and toughened up the last npc a little to make them a little less of a pushover. implimented forzanes new nav meshes which will make the full interior and initial obtaining more follower friendly. added water to the tubs in the full interior. Older changes may be found on the Dev Aveza Google Site. 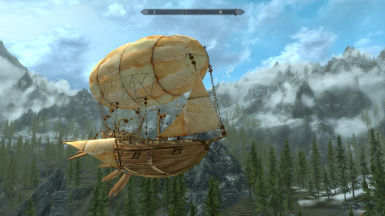 This Airship was originally made by Muppetpuppet as seen in his mod Moonpath to Elsweyr. 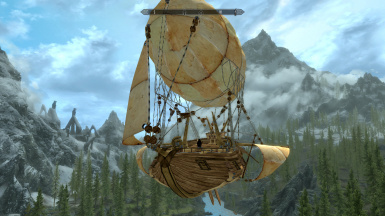 I felt the ship model was gorgeous, and that it should have more use in my Skyrim game. 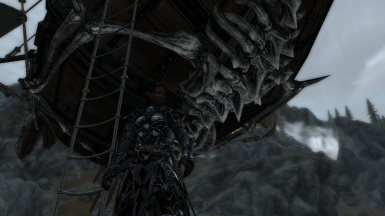 Using the scripts from NoxyGame's Dwemer Skyship Fully Flyable and some creative interpretation of custom complex collisions, I bring you the Dev Aveza. 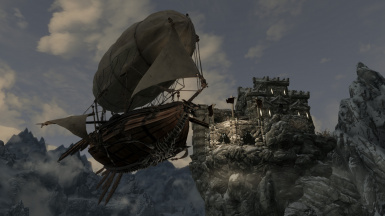 The ship is initially parked on the cliffs of Solitude behind the Blue Palace. In an attempt to encourage people to read what they should by not overwhelming them with text-wall, Tamha has redesigned the mod page. All information formerly found here can now be accessed via the index links below. All links lead to the Dev Aveza's documentation pages. 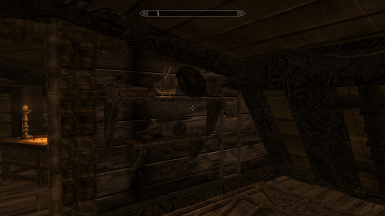 Version 1.8.85 introduces a new autosorting container: a Daedric Artifact display case! Concept and meshes are courtesy of Tueffel's General Displays. Version 1.9.6 corrects several issues with the mod see changelog for details, the current update file makes further corrections I was unaware of when updating, I will continue to add to this archive as needed until 1.9.7 is ready. German Translation Note: File exceedingly outdated. 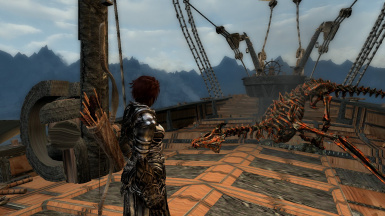 This mod requires SKSE 1.7.3 or later, an FPS of 27 or better, and uses a SkyUI-reliant MCM menu. Please read all directions before asking for support! Many questions and bugs which have been reported in the comments are already listed! Pay special attention to the FAQ and Bug List. If you ask for support and have not read these pages or taken the suggested steps to get the mod working, you will be directed to read those pages! Comments posted without thought to constructive criticism or useful context will be removed. HiAlgo Boost has been reported to cause complete control failure of the scripts, use of the two mods together may cause a great deal of problems, confirmation required.